#285. Invasion of the squid puns! Rising from the depths of the ocean, set on subduing mankind in response to their repeated abuse of the sea, comes Squid Girl! With powerful tentacles for hair, ink spewing skills, and a few other tricks up her sleeves, she is ready to take on her first target. Despite her superiority in many areas, she not only fails miserably, but has also been now bullied into working as a waitress at a restaurant by the shore. This is one relentless squid ready to ruin lives, and inadvertently create fun memories. Squid Girl is exsquiditely charming in every aspect, I for one welcome our new squid overlord with open tentacles. Squid Girl is an inkredibly funny slice of life anime, despite how basic the setup for most of it's comedy and scenarios are, the anime always found a way to take it to the next level through Squid Girl's reactions/responses. As for the rest of the cast, while they can come off as rather plain, (especially when put next to Squid Girl) their performance onscreen is still just as inkertaining. If you wanna have some simple fun kraken up at squid puns, then I ink Squid Girl is just the thing you need! I would just like to point out that squid puns are actually really easy to fit into normal sentences, just saying, I squidn't know it was this easy. About all I can say is that is was cute and fun to watch. Nothing about it was, say, ground breaking or especially clever, and 90% of it played out exactly as expected, but it was satisfying nonetheless. Basically it's candy. Screw your diet, just eat the dang candy already. Member 3 - Rated 1 out of 5 stars. Member 4 - Rated 1 out of 5 stars. Member 5 - Rated 4 out of 5 stars. Overall rating: 2.8 out of 5 stars. Club chose to move on to the next series on list rather than watch the second episode. When I first attempted this series a year ago, I was unsure how much I'd like it. I just wasn't in the mood for silliness at the time but now having watched it again....I love it! I will say that it did take a couple episodes for me to really get into but once I did..I was all in. I did end up docking a star for the overall ending situation, though. I just feel like they left this off with the expectation of a deeper story line with a season 3 or even a couple movies that would have really wrapped this up. The manga wrapped up in 2016 so maybe this could still happen? Hope so. If it does, there's a good chance I'll be editing this to change from a 4 to 5 star rating. While normally I'm not that much into comedy in Anime, this series was definitely a positive surprise. While the premise is absurd, main characters are quite well fleshed out and the humour surprises with it's originality. A lot of comedy titles makes me cringe, but this one proved to be absolutely charming and made me seriously like the cast with all their flaws and peculiarities. I think Squid Girls is especially good when you look for something to relax with/something to cheer you up, above all it's nearly always brimming with positivity. 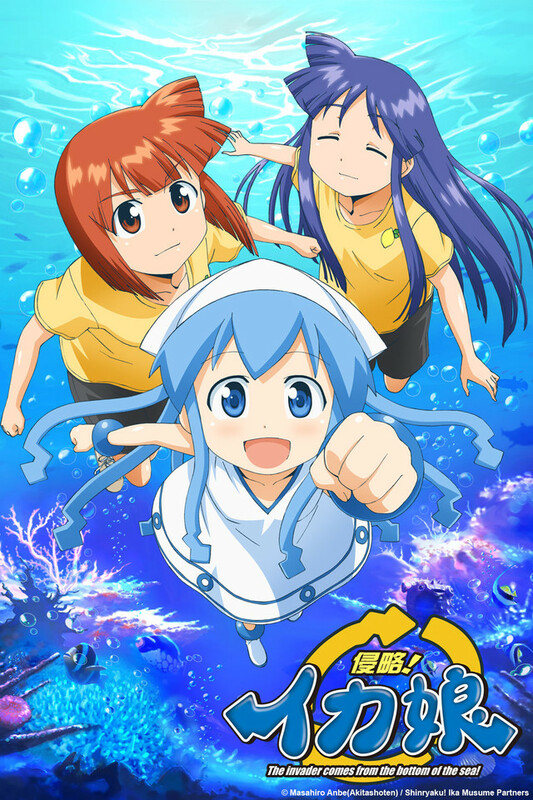 While I had my doubts approaching it and got a few minor complains after finishing the series (especially lack of continuity in character development - Squid Girl's behaviour is weirdly inconsistent at times), I can wholeheartedly recommend it to pretty much everyone. It might not be a masterpiece, but it serves its purpose exceptionally. It's a slice of life type of show with a mix of humour. If you are looking for something simple and entertaining to watch, this will be the choice. I found this show by pure hazard and i was extremely happy to have found that ! When I was younger, i really liked this show, but upon rewatching it I can't help but notice how basic of a story this is. It's like Sgt. Frog but with a smaller cast and less conflicts. The character's are all pretty basic. The animation is simultaneously all over the place but still not doing much overall. I would've given this a one star rating, but I don't want people to look at this reviews title and think I'm being sarcastic. I think if you want a dumb, simple show this is great. Just make sure you don't expect anything more. Love this show. It is incredibly cute and charming, but is genuinely laugh-out-loud funny at times. Going in, I seriously expected the incessant squid-themed puns to get old and tired, but honestly they grow on you, and they are not as in-the-way as you might expect. 5/5, would recommend. A MUST WATCH AND BEST ANIME EVER!!!!! It is just the best watch it right now, drop every thing and watch 1000/10 would watch again. the anime is relay funny and is relay cute. words cant describe how good this is. only a third season would do this show justices. IT'S THE BEST EVERY WATCH NOW!!!!!! ITS BETTER THEN DEATH NOTE TOKYO GHOUL AND ATTACK ON TITAN COMBINED!!!!!! !